The biggest key to me and staying on track is menu planning! I truly believe that your weight loss is about 80% what goes in your mouth and 20% exercise! Yes, exercise is SO important - but what you eat is even more important. Also, why put in all that work at the gym just to ruin it? Spaghetti Squash Carbonara -- I have tried spaghetti squash in the past, but honestly I didn't totally love it. This, however, looks amazing! I try not to eat a lot of pasta, so this may just be the perfect solution for me! Crockpot Honey Pork and Apples -- My husband's favorite meal is pork tenderloin. I think this is going to be a fantastic way to change it up a little bit - and who doesn't love the crockpot? I will probably serve this with salad and a sweet potato. Slow Cooker Veggie Meatball Soup -- This is a meal my friend Amy made for our Freezer Meal Swap. It'll be a great way to get in some veggies! Organic Soup & Grilled Cheese -- I have found some organic clean (and delicious) tomato soup at both Kroger and Trader Joe's. We'll make some grilled cheese with whole wheat bread and cheddar cheese. If you want to go lighter - have a salad instead! This is day 15 of clean eating, and I am proud to say that I am at the lowest weight I have been at in a LONG time! I had a scale victory on Wednesday, and it felt wonderful. I have lost a total of 30 pounds! 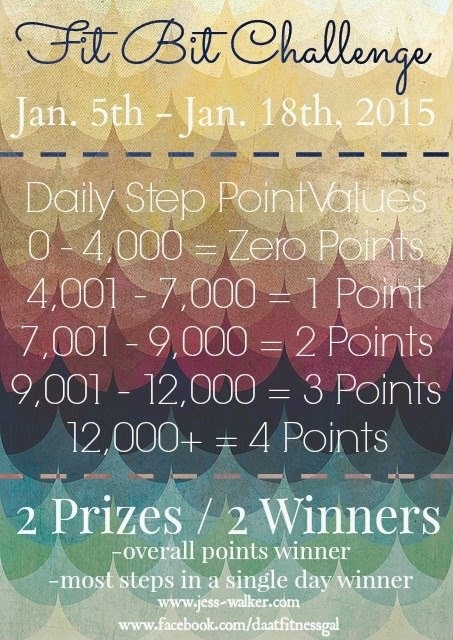 I only have about a 1/2 pound left to lose to get my next prize envelope - a Stitch Fix! I reward myself with a prize envelope for every 5-10 pounds lost (new FitBit band, new workout outfit, mani / pedi, Stitch Fix, shopping spree). The prizes get bigger and better the closer I get to my final goal. Again, I would say about 90% of all that I have eaten has followed the clean guidelines I posted in the beginning. I continued to track my calories using MyFitnessPal, however it has been more of a guideline. I didn't know the calories for some of last week's dinners, so I tried to focus more on portion size and when I am full. I really liked Katie Ferrell from Dashing Dish's take on calorie counting. I do it because I need that structure - but I would love to get to a place where I feel like I don't need to and can still maintain. I did better with my water intake this week (you're supposed to drink 1/2 your body weight) but still need to focus more on my veggies! Activity! I am still working hard at the FitBit challenge hosted by Jess Walker - Day at a Time Fitness Gal! Today is day 12 of the challenge - only 2 more days left! I am SO proud that I have gotten in my 12,000+ steps EVERY day! Last time I posted day 1 - 4. On Monday, I earned a badge for 25,000 steps in a single day! That is an achievement I may never reach again! I hope I win!! I have worked SO hard. How did you get active this past week? What was on your menu? 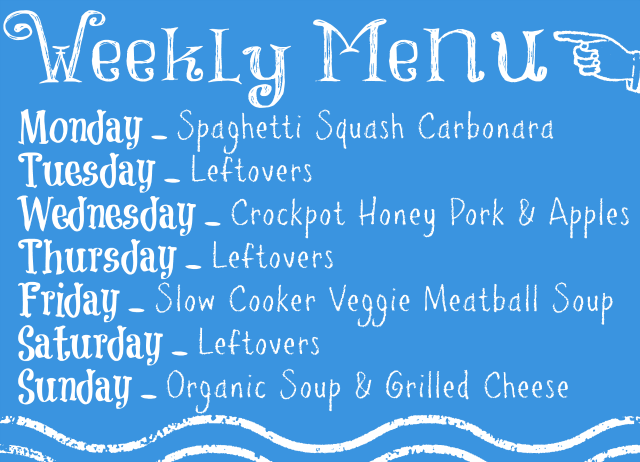 I love that you included leftovers on your weekly menu plan! That's a trick I might need to start incorporating into my menu planning. Excited to have found your blog! I'm newly married, a teacher, and working on some health/fitness goals as well. Seems we have a lot in common! As a child, I used to hate leftovers. Now - I love them! It means I don't have to cook again. The trick is making sure to make enough that there will be leftovers. Just saw the comments about the leftovers. We tend to eat leftovers for lunch the next day. I do a LOT of slow cooker recipes during the week, especially in the winter months. As for activity, I've been working out 5-6 days a week. And this week, I am officially working out with a personal trainer (a college student who is doing her internship this semester and using me and a few others to get her hours in.) I'll work with her twice a week and I'm already exhausted. We'll use them for lunch, too - depending on how much there is. I LOVE my slow cooker. Awesome work, Jaime! I love getting to go to my trainer when I can afford to. Sounds like you have a sweet deal! It's a great exhausted, though, isn't it?